Bananas are very popular in my house but the moment the skins start to turn brown, my children turn their noses up at them. I often get left with a few in the fruit bowl that needed using up. Here are some ideas for what to do with them. Banana Muffins These are delicious and can be eaten at any time – even for breakfast. There are plenty of recipes on the Internet but I used this one. I couldn’t find any paper muffin cases in the cupboard so I used my silicon muffin tray to make these. 2. Banana Loaf This banana loaf is so delicious! There are a lot of recipes online. Some call for cream cheese icing which I think goes really well with banana. I drizzled this one with glacé icing as I didn’t have any cream cheese. You can add lots of different things to banana loaf such as chopped walnuts, raisins or cinnamon. It’s also nice if you substitute some or all of the flour for wholemeal flour. 3. Cooked Bananas You can do these in the oven but I usually cook them in a frying pan for speed. Slice the bananas in half along their length. Put in a pan with some butter, lemon juice and brown sugar. Cook until they are brown and soft, and the sugar is becoming a sticky sauce. They are delicious served with cream. 4. Banana “ice cream” I have put the words ice cream in inverted commas because there is no cream involved with this recipe. It is very simple and healthy as the only ingredient is bananas, although I like to experiment by adding other things such as cinnamon or peanut butter. The one pictured here has cinnamon added which gives it its lovely golden brown colour. Chop up some bananas and put them in a plastic bag in the freezer. Freeze them until they are almost solid but not quite. If they have been in the freezer too long, take them out and leave them at room temperature for about an hour. You can also add other soft fruit to the bananas such as strawberries, raspberries or peach. Blend the fruit with a hand blender until it is smooth and resembles ice cream. You can fool yourself (or your children) that you are eating ice cream when it is actually just fruit. The wonderful thing about peanut butter is that it can be sweet or savoury, just like pancakes! So why not put the two together on pancake day? Whether you prefer it crunchy or smooth, it adds flavour and texture to your pancakes. Here are some ideas. Mushrooms are delicious in pancakes, and the peanut butter adds a little saltiness. Love it or hate it, marmite adds a special savoury taste to any dish – even pancakes. Cut the mars bar into small pieces and roll it up in a hot pancake straight from the pan, with a dollop of peanut butter. The heat from the pancake will melt the mars bar making a gooey chocolaty caramel filling. The peanut butter adds that extra nuttiness. These three things are perfect together, rolled up in a pancake. It’s not pancake day without maple syrup, and it’s even more delicious with peanut butter. 6. Peanut butter, cinnamon and mascarpone. Mascarpone tastes amazing in pancakes – so creamy and luxurious. The cinnamon and peanut butter add flavour to the creamy texture. Pancakes are great with alcohol and the peanut butter adds a bit of texture. Have a great pancake day and let me know if you try any of these ideas. I get an organic veg box delivered once a fortnight by Riverford. I really look forward to having fresh vegetables delivered to my door. I like to try new things that I haven’t tasted before and things that are not so easy to find in the supermarkets. Here’s what today’s delivery has brought. … onions! Onions are a great addition to any dish, raw or cooked. Black kale. My absolute favourite way of eating kale is kale crisps. Tear the leaves off the tough midrib. Heat some extra virgin olive oil in the oven, toss the leaves in the hot oil, sprinkle generously with salt and then put in the oven for about ten minutes. Give them a shake every so often. They should be crispy and just beginning to turn brown but not blackened to a crisp. Even my vegetable-phobic son will eat them. Courgettes. I love courgettes in all sorts of recipes. Courgette frittata is a big favourite, or simply cooked in some butter as a side dish. Avocadoes. My favourite way of eating avocadoes is to slice them in half, remove the stone and fill the hole with a dollop of mayonnaise. Then I just eat it with a spoon. Deliciously creamy! Leeks. Leeks are delicious in all sorts of recipes. I think my favourite has to be leek and potato soup, but they also go very well with mushrooms in a quiche. Brussels sprouts. It must be nearly Christmas if I’ve got Brussels sprouts in my veg box! I love them as long as they are not over-cooked. My usual method of cooking them is to put them in a pan with just enough water so that it will all evaporate by the time they are cooked. You might want to keep an eye on them in case it all evaporates too soon and you ruin your pan as well as your sprouts. Cooked in this way, the sprouts keep all their nutrients and their flavour rather than throwing it all away with the water that you have boiled or steamed them in. Cosmos potatoes. According to the bag, these potatoes are good for mashing or baking, so we might have jacket potatoes for dinner one day this week. Or I might team them up with those leeks and make some soup. What is your favourite vegetable and how do you like to eat it? 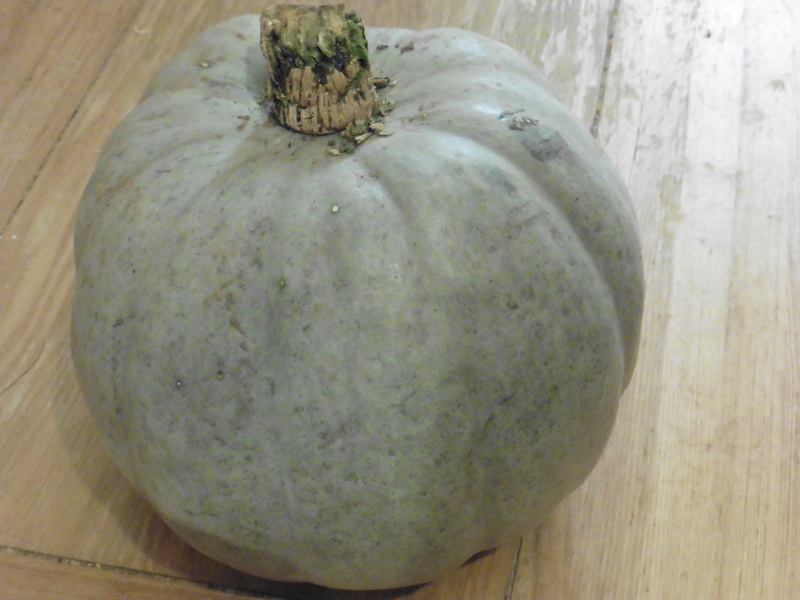 This wonderful winter squash has a bluish grey skin and a vivid orange flesh. Its flavour is deliciously sweet and nutty. Here are seven ideas for how to use it. Roasted. Just slice the squash, drizzle with olive oil and sprinkle with herbs before roasting it in the oven. There’s no need to remove the skin – it comes off more easily after roasting. Soup. You can cook the squash in a pan but the flavour is more intense if you roast it in the oven. Add some warming spices such as ginger and chilli, and some cream for a rich flavour. You can incorporate other vegetables such as carrots, leeks or tomatoes. Squash pie. Crown Prince squash has a sweet flavour that makes it an ideal alternative to pumpkin for making pumpkin pie. Mix eggs, pureed squash and condensed milk and add spices such as ginger, cloves, cinnamon and nutmeg. Pour into a pastry case and bake. Instead of condensed milk you can use cream or evaporated milk and then sweeten with brown sugar or maple syrup. Frittata. Squash and egg are a great combination. Add some sage too, and your favourite cheese. Risotto. Roast the squash first and make sure you use a good risotto rice such as Carnaroli or Arborio. Pasta filling. Squash makes a delicious filling for ravioli or other stuffed pasta. Curry. Crown Prince Squash is a perfect ingredient in a delicious curry. Use coconut milk in the sauce. It goes well with chick peas or lentils too.